Built in the early 14th century Ballymote castle stands in the market town of Ballymote in County Sligo, in the province of Connacht. The castle exchanged hands between the Irish and English many times over the course of 300 years. The Medieval castle was built by Richard de Burgh, 2nd Earl of Ulster and 3rd Baron of Connaught, in 1300. As a powerful Anglo-Norman noble, he needed to protected his possessions in Sligo. He did so by constructing one of the strongest castles in the Province of Connacht at the time. Similar in design to King Edward I of England’s castle at Beaumaris in Wales, de Burgh built Ballymote with 10-foot-thick walls. The gatehouse on the north wall had twin towers to protect the entrance. Two D-Shaped towers stood at the east and west walls and could be accessed via 3-foot-wide passages within the walls. The inner courtyard measured 150ft squared but there is no evidence to suggest a keep existed. De Burgh planned for a tower and gate on the south wall but didnt complete it. After of the invasion of Edward the Bruce in 1315 and the Battle of Athenry in 1316, de Burgh’s position in Ulster and Connacht was in decline. Ballymote Castle fell into hands of the O’Connors in 1317. They held ownership of the fortification until 1347 when clan Mac Diarmada (MacDermot) took over. The MacDermot’s held onto the castle until the MacDonaghs took ownership in 1381. For nearly 200 years, ownership of the castle passed back and forth between the clans until 1577. It finally fell to the English. During the Tudor conquest of Ireland Richard Bingham had been appointed governor of Connacht under the reign of Queen Elizabeth I. Ballymote Castle was sacked by Bingham in 1584. Four years later it was burned down by The O’Connors, O’Hartes and O’Dowds, the year the Spanish Armada arrived. 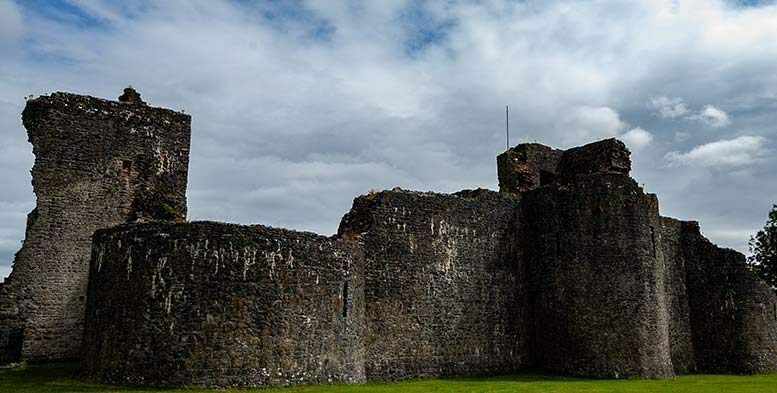 The English finally surrendered the castle in 1598 to the MacDonagh clan. Not long after, they sold it to the O’Donnell clan for £400 and 300 cows. Red Hugh O’Donnell left Ballymote Castle to march to the battle of Kinsale in 1601. A year later the castle surrendered to the English. By now Ballymote Castle was in a bad state of repair. Taaffe, a family of Welsh descent who arrived during the Norman invasion of Ireland, took over the castle in 1610. They owned the castle until 1652 when they had to surrender it to the Cromwellian forces who were invading Ireland at the time. When King William lll of England (William of Orange) invaded Ireland as part of the Williamite War he sent a force of five thousand men to Sligo. Commanded by Arthur Forbes, 1st Earl of Granard, they sacked Ballymote Castle in 1690 from Captain Terence MacDonagh of King James II army. Baldy damaged from the latest attack its fortifications were now useless and the castle fell into ruins.